In the past it hasn't been easy to heat koi ponds, it meant getting plumbers out to run gas lines or propane lines. 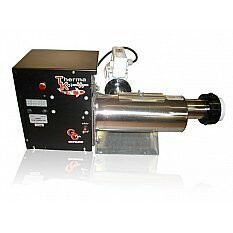 Now, with the ThermaKoi line of heaters, life just got easier for you and more comfortable for your koi.Made of 316 stainless steel and utilizing highly accurate electronic thermostats these units keep the water temp constant. Installs easily and quickly. Just plumb in line (2") entering the water at the end with the Safety flow switch and out the other end to the pond. Over load protected and built to last.